When designing in Object Oriented Programming (OOP) the question I always ask myself when trying to figure out where some piece of code should go is, “Who does this behavior belong to?”. If our class names are nouns, such as Orders, Books, ProductColors, ERPOrderSender, etc., then it is usually easy to figure out what behavior (or class method) belongs to which class. Recently I had to add a condition to our order fulfillment workflow to look for suspected fraud orders, and stop them from being processed. Originally, I had written a simple method to do this inside our ERPOrderSender Class, which is the class responsible for sending EDI order data to our ERP system. After a while, these new suspected fraud orders start showing up in our “Stuck Orders” Report, and I needed a way to tell that report the reason these orders were stuck. Clearly the ERPOrderSender Class was no longer the right place to house the “Are you a suspected fraud order” code. In this case I created a new class called OrderReview, and a new method called getReviewStatus(). The new framework now works equally well when called in the context of Order Fulfillment, and in Reporting. OOP is great. It allows us to think in terms of system behavior. This makes our system easier to talk about in natural language. Which is just more fun – and makes our lives easier. I’m looking to replace our Magento Ecommerce Server with something “Nice” – Something that is not complicated, not over abstracted, something that is well … fun to work with. Saleor is an elegant solution. It is an Ecommerce app written in Python and Django. I was able to download it and get it up and running in about 2 hours. That says a lot. 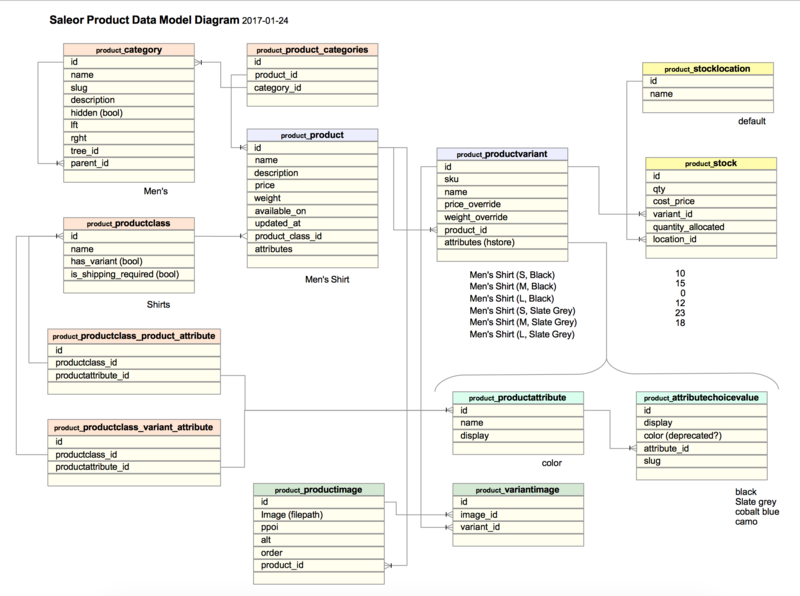 Good Data makes life easy; If we model all our the business logic in the database then the application layer is trivial. Case in point: I’m implementing a User Access Module. First I define a list of Access terms: Things like dashboard (allow view dashboard), orders (allow view orders report), download (allow CSV downloads), etc. Then I come up with a list of Roles: CS Agent, and Executive, will do for now. 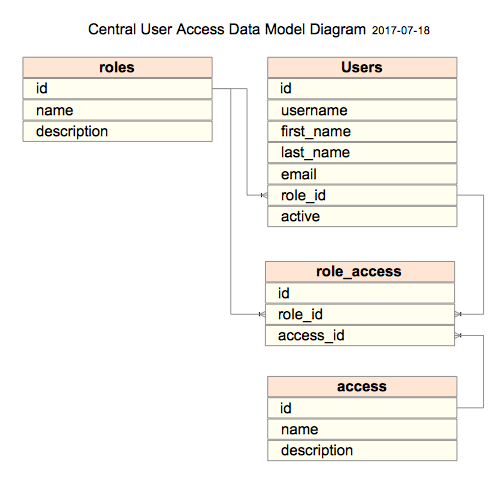 Then I create a role_access many-to-many join table with just id, role_id, and access_id. Then I add a role_id to the users table. Then I painfully craft all the static data in access, roles, and access_roles tables in csv files that gets loaded when the tables are created. When that’s done it looks like this. And that’s all there is to, it. Express your business logic in the database and the rest follows easy. Complexity is only Simplicity x 1000 — A mathematician friend once told me that. The idea struck a chord with me and has stuck with me ever since. Everything in this world is complex. When we design computer systems our goals should be to encapsulate that complexity into simple business level concepts. They in turn can be broken down into smaller and smaller simple systems – and then no part of the system will be complex on its own. Here is an example. Say you need to download and update pricing information on a regular bases. The new process should simple be called ‘Update Prices’. And nothing in it is complicated. So break it down. Make it simple! Everyone will be happy. When should we use secure practices and when not to? Like all good advice secure practices need to be weighed against practicality. In a perfect world your system will have full test coverage, automated testing, database migration scripts, automated deployments, adhere to common coding practices, have identical dev and test environments, as well as excellent documentation. In that perfect world the best way to protect production systems is not to allow logins – and to do everything through automation. But what if that is not the case? What if you’re supporting a legacy system that is hacky, poorly designed – and the business is relying on it at the same time? In this case your best line of defense is think creatively and have full access to all production systems – so you can react quickly when things go wrong. If automation can not be relied upon – then its hands on test, tweak if you have to, retest, and commit. Until you can replace the system with something more stable. Sometimes you need to take your safety belt off, if only for a short time. The Database, Config and Logging are at the core of all application development. Everything starts there. A Database System stores all of the applications data. The storage itself can be anything from a loose collection of files like jpegs, a nosql db like mongodb, or a full fledge relational database like mysql or postgresql. This subsystem sits right below any Model Objects. A Logging System should be built in from the word go. All backend tasks should be logged. One philosophy is that all events write a single line entry of Success or Failure. Each event can optionally also write multiple Warning or Debug logging messages. When done this way your logs are themselves databases of all system events. You can can easily answer questions like how many transactions processed today, and how many of them failed. These three subsystems are needed for all application development. Here is a link to a library I have written that provides these functions. Which I reuse it all the time. If you don’t diff before you commit you don’t know what you’re committing. If you believe as I do, you should only commit working code, then we must safeguard our git repos from danger from ourselves. That’s why you should always run git diff and scrutinize the changes before git commit, to make sure debug, merge conflicts, and other unwanted changes are not making into the big time. It’s like look both ways before you cross. Diff before you commit – make it a part of your stitch in time. You know you’re doing a great job when, adding new functionality to a code base, and you wind up removing more code then you’ve added. Less is More. I once heard boast a programmer that he’d written million lines of C code. That seemed undesirable to me. Better you should boast that you’ve written an entire system in under 1,000 lines of code. Doing more with less, requires good design and a lot of reusable code. Doing more with less means you have less to maintain, and less that can go wrong. So pride yourself on how small your code base is, not how large it is. Let’s standardize how we write SQL. What joy. Rarely, have I seen consistency in how SQL is formatted, and often it is not even considered. Lower case all keywords. See Why Shout in your SQL? Keywords that group sections – select, from, where, group by, having, order by, and limit should be on their own line with no leading spaces. Indentation should be 3 spaces. Select, group by, and order by clauses should have each field on it’s own line, but may not if the list is small. Select fields should be broken up into multiple properly indented lines when long or complicated. For example, when using functions like concat_ws, substring, etc. Joining keywords on, and, and or should be never start a new line. Semicolon should be on it’s own line with no leading spaces. These conventions have made my life easier. Easy to read code is good code is easy living. So go clean up your SQL scripts! And have fun.